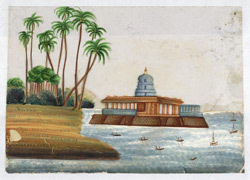 Gouache painting on mica of a small temple at Rameswaram, by an anonymous artist working in the Trichinopoly style, c. 1850. Inscribed: 'Cocoa Nut Trees, a Temple built in' 'the Sea, Native Boats & small Craft'. This drawing depicts a small temple with a pillared portico in the sacred Hindu town of Rameshwaram, situated at the extreme south eastern edge of India, connected to the mainland by the 2 km long Indira Gandhi Bridge. It is an important Hindu pilgrimage site as it is believed to be the place where Rama worshipped Shiva after returning from Sri Lanka having killed Ravana and rescued his abducted wife Sita. The large Ramalingeshvara temple complex was founded during the Chola period (c. 12th century) and was added to during successive dynasties. The temple is famous for its 54 m high gopuram, the entrance gateway.